Christmas is a time of decorations, excessive sweets, and crowded stores. Christmas is a time of family, friends, and meaningful traditions. Christmas is a time of singing, laughing, giving, and love. Christmas is a time of idealized life. At Christmas, the world is just closer to what it should be all year long. I used to think that Christmas was a time when we all ignored our real problems. The hustle and bustle of the busiest time of the year somehow makes us euphoric enough to forget our stresses and struggles. But, I have come to realize that maybe I had it all wrong. Maybe, Christmas time makes us realize exactly who we should be and serves as a time of hope for what the world could actually be someday. So, we are a little nicer. We share a little more. We give a little more. We think of others a little more. Christmas is a beautiful time of the year. But, Christmas also has its ugly side as well. We get all mixed up in making sure we are giving our kids as much as our rival neighbor. We are kind in the office, but our rage comes out in full force while in line on Black Friday. Christmas may make us forget our problems, but it can also highlight them at the same time. But, this is exactly what we find in scripture. The whole Bible is centered on Christmas and the life of Christ. The perfect hope of God, given to us in the person of Jesus. But the build up to that hope is full of ugly, disgusting, and sinful stories. Stories that demonstrate the worst in humanity. Stories that demonstrate our desperate need for the hope that only God can provide. This Christmas, if we must hide from our struggles, let us hide in the hope of God in Christ. This Christmas, let us rejoice in Jesus and hold fast to the hope He has provided for our brokenness. 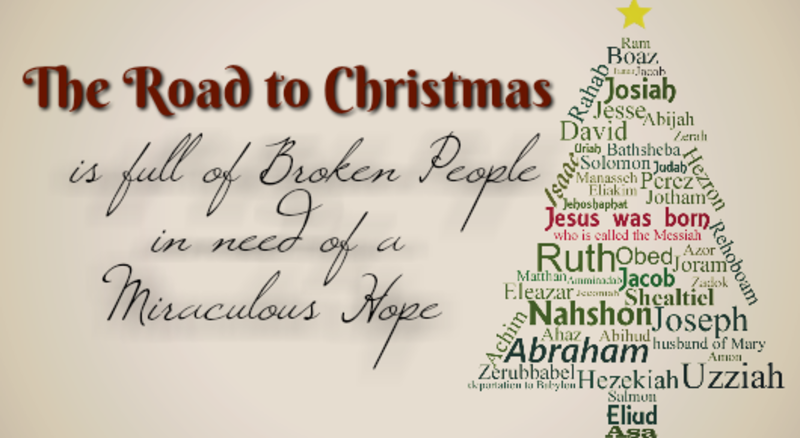 Let's travel the Broken Road to Christmas in hope and Joy.